Baby bottle tooth decay- Sugars from juices, milk, and formula can fuel the bacteria in a baby’s mouth to begin producing the acids that cause cavities. This tends to occur when a baby or toddler is allowed to sleep with a baby bottle in the mouth or crib. Thumb sucking- After the age of 5, this habit can lead to poorly aligned teeth, an overbite, and the abnormal development of the jaws and palate. Tongue thrusting- If the tongue presses against the backside of the front teeth during swallowing or due to a subconscious habit, the front teeth can be pushed into an overbite. 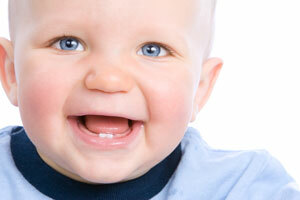 This can affect a child’s speech pattern as well as the growth of their permanent teeth. To prevent the improper tongue movement, the dentist might place an appliance on the back side of the teeth to redirect the tongue, or a speech pathologist may be consulted. Premature tooth loss- If baby teeth are lost too soon because of cavities, accidents, or lack of jaw space, the adult teeth may be forced to come in incorrectly. This can lead to crowded or impacted adult teeth, jaw problems, and inadequate chewing. If a baby tooth cannot be saved, the pediatric dentist might suggest an appliance called as space maintainer to hold the neighboring teeth in place until the adult tooth comes in. For more help and advice on protecting your little one from complications due to early childhood dental problems, consult a Charlotte pediatric dentist today.